Last week was the second Dressmakers Ball, held in my home city of Leicester. The event is wonderfully organised by the lovely Sarah and Freya from The Crafty Sew and So. I didn’t attend the first Dressmakers Ball (which was held in 2017 I believe), but remember thinking how much fun it looked at the time. So when the ticket sale was announced last year, despite feeling a little nervous as I always do about social gatherings, I decided to bite the bullet and buy a ticket. I am so glad that I did. Choosing the right dress took a great deal of deliberation. Despite having lots of ideas initially about fancy big petticoats (which I would love to go for another time), I kept on coming back to The Anna Dress from By Hand London. 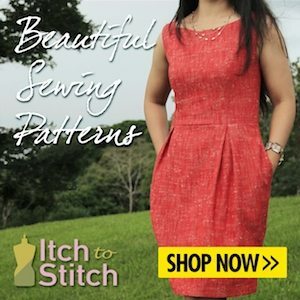 It’s a beautifully classic dress which can be made in a midi or maxi length, with kimono sleeves, double pleats below the bust and a great swishy panelled skirt featuring an optional thigh split. This was definitely the dress for me and when my husband asked me what I wanted for Christmas, this is the pattern that I asked for. My fabric choice was a rich black cotton velvet (no stretch). I mean, everybody needs a little black dress in their lives don’t they? This is the first time that I have sewn with velvet and so I was careful to read up as many blogs and articles about sewing with velvet that I could find before cutting into this precious fabric. Before I did this, I also made up a quick toile, and I absolutely loved it! I was slightly concerned that the high neckline might be too high and unflattering on me, but quite the opposite – I really loved how the neckline looked. When I made the toile, I found that I had a gaping back neckline. Not to worry though, By Hand London have got your back. On their website there are sew-alongs for the patterns and I had read on the Anna sew-along that this is a common problem with this dress. 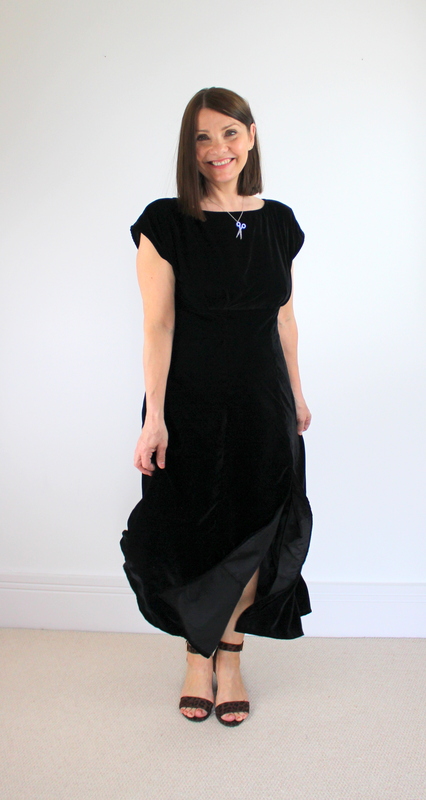 There are a couple of different ways that I could correct this when making my velvet version and I opted to head on over (using their link) to a great blog post from Ginger Makes which tells you how to adapt your back bodice and back facing so that you completely remove any cheeky gaping at the back neckline. It worked a treat, and was really simple! I needed to alter my neckline by 1.5cm. So briefly some of the things that I did when cutting and sewing my dress. I made sure that I decided which way I wanted the nap of the fabric to run and made sure that all my pattern pieces were cut in the same direction. I also cut it out in a single layer on the hall floor as this is a nice big tiled space that I could lay out my fabric without it hanging over a table and pulling and stretching the fabric. The fact that it is a tiled floor turns out to be very important to me too, as let me tell you, velvet sheds A LOT of fluff. It was everywhere. I actually read to keep the vacuum cleaner to hand when you are cutting and this was a great tip! I used a fresh blade on my rotary cutter. In fact – I bought a new rotary cutter as mine has been terrible for a long time, but a new blade is really important – I did use a cutting mat too! A walking foot was crucial I think, and after testing on a scrap of velvet to see that it wouldn’t flatten the pile, I decided to use a longer stitch length than normal too ( I think I used stitch length 3). Although it was slightly tricky to sew with, and made a fluffy mess everywhere, it turned out really great in the end. I wasn’t sure if the invisible zip would be possible with the velvet as I had concerns that the pile would get caught in the zip, but I still went with it and just didn’t sew the zip in as close to the teeth as I normally would and it was fine. The length of the skirt was always going to be long for me (I’m only 5’2″), so I shortened the pattern pieces by 10″ before cutting out. I also lined the skirt. I wasn’t going to, but didn’t realise how much static there would be in this fabric so luckily I had some black lining in my stash to do this. I will admit that I didn’t really have quite enough, so the lining is a few inches shorter than the hem, but never mind. I went for an ankle-grazing length in the end, as I absolutely love my animal print sandals and wanted these to be seen. The thigh split is optional too, but, well, who could resist. The Dressmakers Ball itself was incredible, and I will leave this blog purely as a dress review because I know there are already lots of vlogs and blogs with all the details of the Ball itself. I would like to give a big shout out to my two best sewing buddies though for making the night so special. Kate and Vena had me crying with laughter all night, they truly are the best! It was such a thrill to bump into so many sewing friends, some that I had met before and some that I was excited to meet for the first time. It was quite overwhelming to see everybody in all their stunning dresses enjoying themselves dancing and chatting, it was a night to remember. The photo below is of myself, Kate and Vena taken by a lovely professional photographer, Tara, who was busy all night snapping away! I couldn’t resist wearing my acrylic scissors necklace from my shop. It’s such a fun necklace and I was made up to see so many others wearing theirs! To sum up, I can see lots more Anna Dresses in my life. The panelled skirt is such fun to sew and the flattering bust pleats and fitted bodice is so pretty. I love it! I spotted several other Anna Dresses at the ball, it was a popular pattern and I can see why. Dress it up in velvet or silk, or make it as a pretty day time dress – you choose. Ooh I nearly forgot, to use up some of the leftover velvet, I decided to make a little zipper clutch to match my dress. I used the Pleated Zipper Pouch online tutorial from The Stitch Sisters (which was a pattern that was gifted to me), and whilst it was made using the most inappropriate fabric for this pattern (this pattern calls for nice crisp woven fabrics), it still came out pretty well I think. I also used a small amount of animal print cotton sateen purchased from the lovely Sarah at Like Sew Amazing. It kind of matched my shoes!